Funko stock closed out 2018 down substantially from its lifetime high, but its share price still nearly doubled across the year's trading. Shares of Funko (NASDAQ:FNKO) lost 12.5% of their value in December, according to data from S&P Global Market Intelligence. The pop-culture-merchandise company's stock sold off along with the broader market to close out the year, but it still ended 2018 with its stock price having nearly doubled. 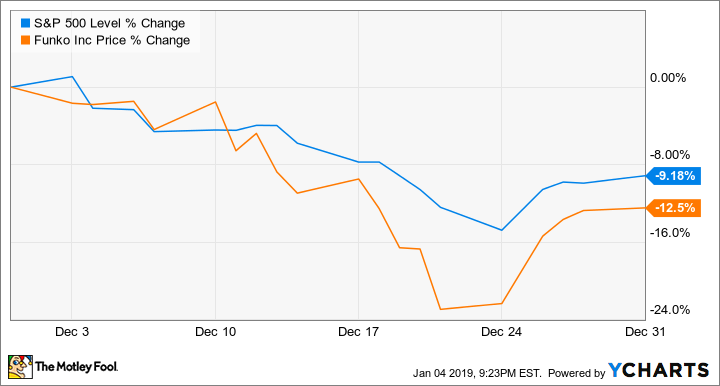 Each of the major U.S. stock indexes posted dramatic sell-offs in December, and Funko stock was one of many to see substantial declines across the stretch. 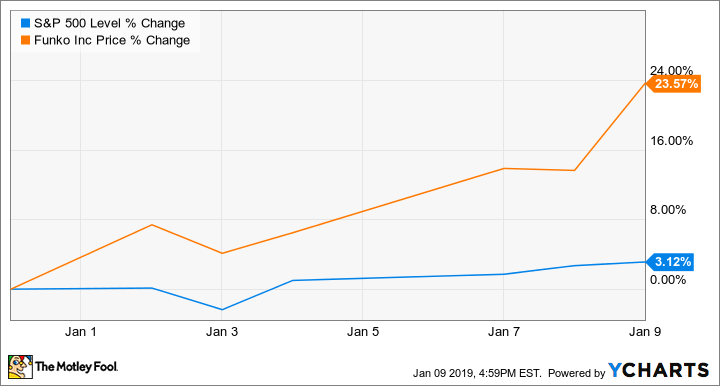 There does not appear to have been any company-specific news that played a big factor in last month's sell-offs, and the stock has since recovered from the dip. Despite ending the year on a down note, Funko stock still enjoyed a massive run in 2018. Shares closed out the year up roughly 98%, despite also being down 58% from the lifetime high of $31 per share that they hit in September. The company is seeing strong sales momentum thanks to impressive demand for its vinyl figurines based on a wide range of popular entertainment properties. Funko had its initial public offering in the last quarter of 2017, and the stock's trading has been volatile as investors have attempted to assess whether the company is going to be a long-term leader in the pop-culture merchandise space, a flash in the pan, or something in between. The stock saw big sell-offs in November, following the release of third-quarter results that arrived with a 24% year-over-year sales increase but paired with declining profits and growth margins. Shares have regained ground early in 2019, but uncertainty surrounding the company's outlook suggests big swings could be the norm going forward. Funko stock has bounced back this month, more than making up for its December losses with a 23.6% rally in January so far. Encouraging data for the U.S. economic growth and consumer discretionary spending have lifted the overall market and increased investor enthusiasm for Funko stock. A favorable outlook for the overall entertainment industry extends to the pop culture merchandise space, and there's appeal in Funko's concept of bringing together a huge selection of pop-culture properties under a unifying aesthetic. However, whether the company's figurines will have long-term staying power remains to be seen.